Unique, intricate and head-turning hairstyles for men can often say much more about you than mere words ever could. Dreadlocks are a hairstyle that has always managed to intrigue others due to its unique beauty. Although they have been around for decades, dreadlocks still garner loads of well-deserved attention. Lil’ Wayne and Wacka Flocka Flame brought dreadlocks to the forefront but the exposure still seemed limited. This is where the power of Thirsty Roots comes in. Dreads are becoming more and more popular and you can find them on anyone from hippies and computer geeks, to hipsters and surfers. From extra long to super short and everything in between, dreadlock run the gamut of styling possibilities. By far the most popular, and effective way of making dreads is backcombing. Backcombing is a purely natural way to start your mens dreadlocks hairstyle and there won’t be any chemical damage done to it. 3 months is about the average time for dreadlocks to settle when they have been done through backcombing. You should section your hair into squares for each dread that you want, determining thickness yourself. Begin combing the hair backwards towards your head, this should be done until the hair is packed in nice and tight and the bottom of the dread, then you should move up the dread until the whole thing is done. At the end of the process each dread should be fastened with a rubber band at the tip of the dread. Give your hair a gentle wash after about a week, a small amount of wax should be used regularly, and gently rolling your dreads every day will help them mature. 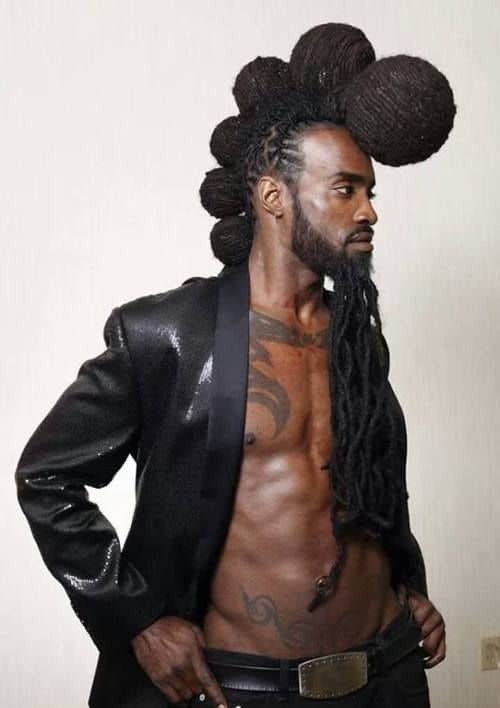 Mens dreadlocks hairstyle is definitely here to stay with new styling options popping up all the time. Whether you want to style them for a professional look or channel your inner rockstar, there is a host of hairstyles for dreads to choose from… so have fun!